The belt is populated by icy minor planets. These minor planets are scarce and far removed from each other. The nearest objects in the belt are at 30-35 AU from the Sun. The farthest extend beyond 100 AU. They begin at the outer edges of the Kuiper belt and extend much further out. 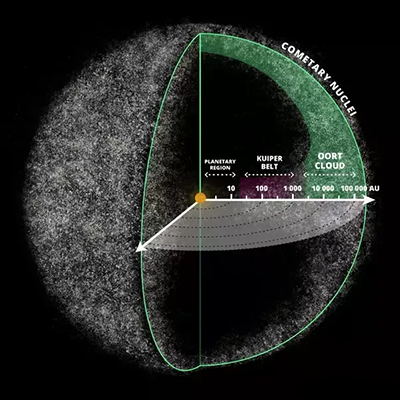 Since the Oort-cloud has not yet been found, no matter how much the astronomers wish to discover it, the function of the Oort-cloud is now prescribed partly to the Scattered Disc. The Scattered Disc is believed to be the source of periodic comets. Since the comets that currently fly around our Solar System could not last longer than 10,000 years, an idea of an Oort-cloud has been proposed, to get around the problem of such young comets in what is supposed to be an old Solar System. There is not much difference between the objects of the Kuiper belt and the scattered disc. Objects can migrate from one to another. The two belts can be considered the same belt for all practical purposes.